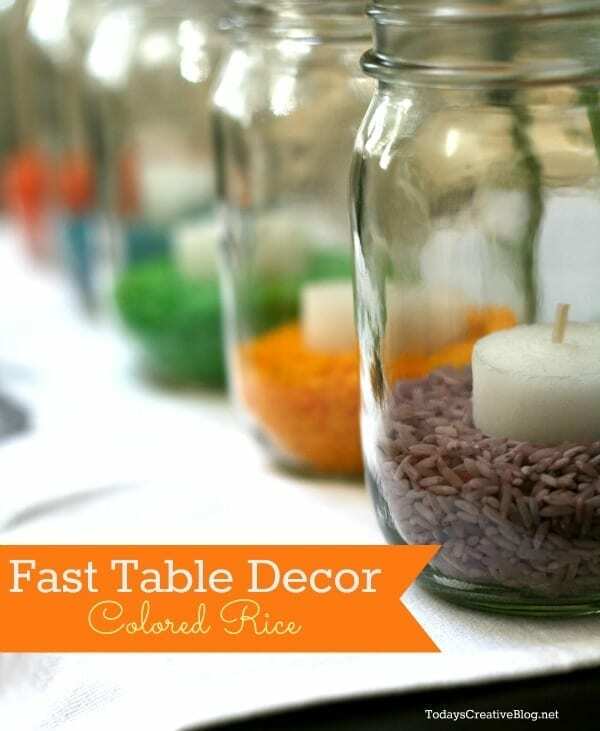 Colored Rice is a great way to create fast holiday decor, no matter the holiday! It’s also a great spring craft for kids. Easter is right around the corner. Not a lot of time to decorate since it’s on March 31st this year. 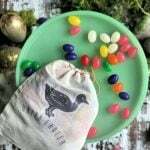 We seem to be so focused on St. Patrick’s Day, but Easter is way more fun to decorate around. Once again, I don’t go all out for specific Easter decorations, but I like to reflect spring and a hint of Easter. I got the wild “hare” to decorate with colored rice this year. If you haven’t noticed, I am the queen of quick table decor! Since I’m always into very EASY ideas that are hard to mess up, I thought coloring rice would be perfect. I loved how it looked layered in red, white and blue for Memorial Day and it was simple, so I thought a few Easter colors would look springy. 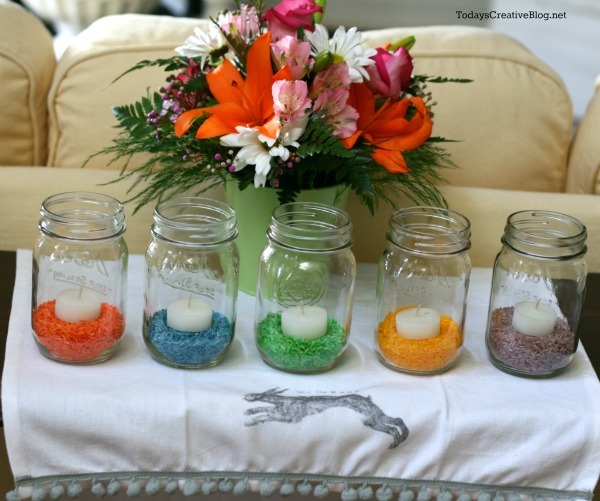 If you’re ever stumped on what to decorate with, just grab a few mason jars. 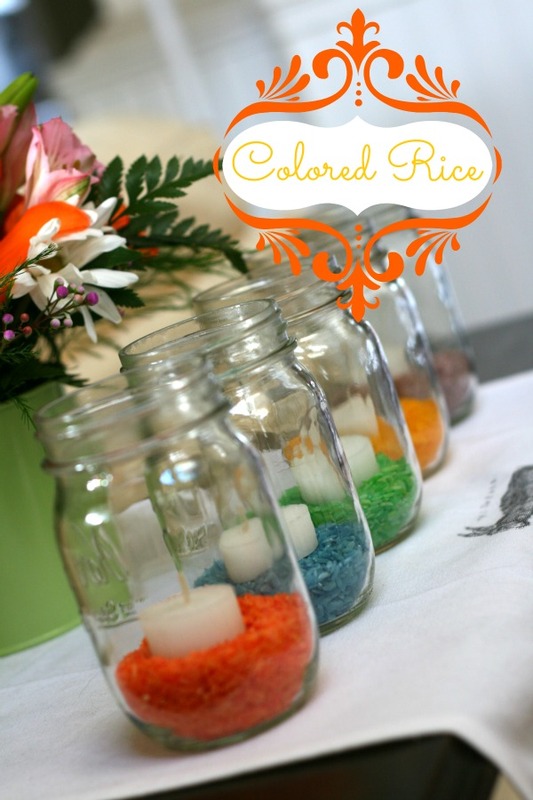 Seriously……..what CAN’T a mason jar do? I made 5 colors of rice for 5 different jars. Perfect for lining up along the dining room table or my entry table. This is so ridiculously simple, you’ll be slapping your forehead…….DOH! Or is that just me? Once your rice is fully coated, pour onto a paper plate and spread out. This is a great craft to get the kids involved……..just make sure the bag is sealed. Trust me. So many options for layering all the pretty colors, or using individually like I did. If you’ve got warm weather already, wouldn’t these look pretty on the patio? So there you have it. 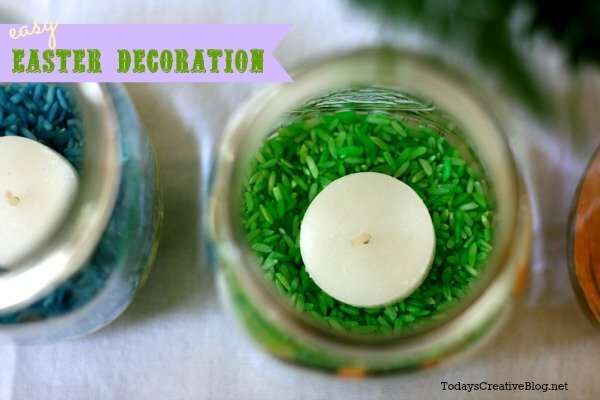 Simple, yet cute table decoration for Easter. 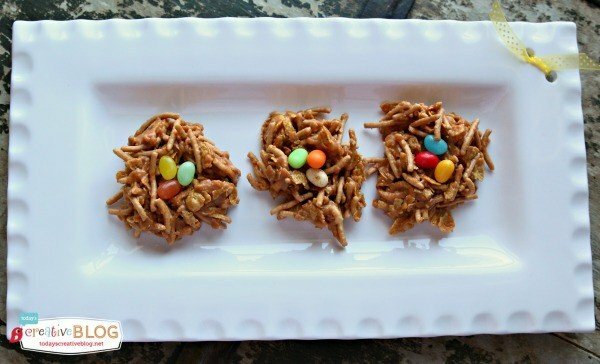 Birds Nest Cookies are a tradition! 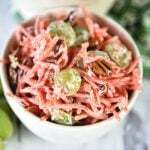 – Click on the photo for the recipe. 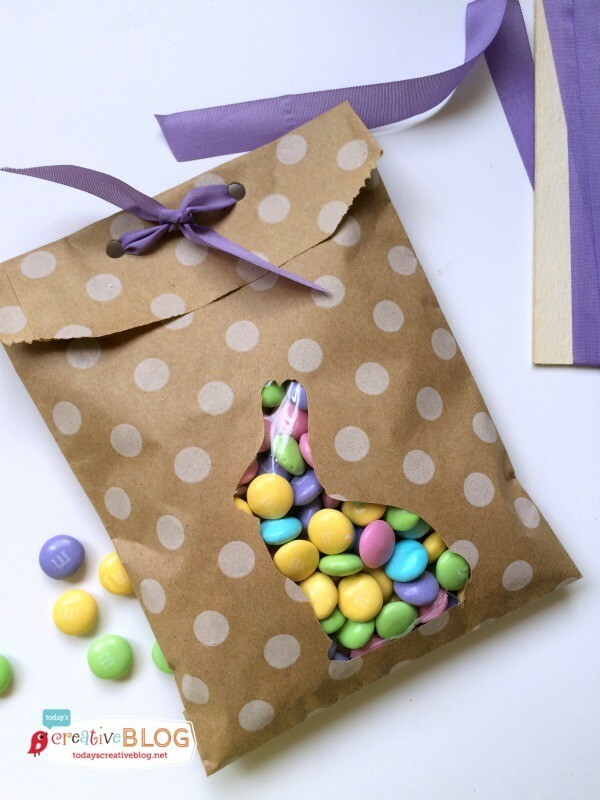 Make adorable Easter Treat Bags- Click on the photo for directions. 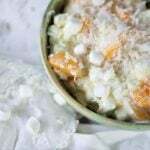 Hello – would you be able to cook/eat the rice afterwards, or does the rubbing alcohol make create an issue with consumption? Since rubbing alcohol is mixed with the rice, I wouldn’t eat it. You could color it without the rubbing alcohol if you want to eat it. I love the colored rice! 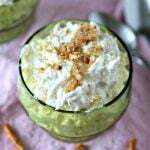 And I have all the supplies at my house to make this! Hey Kim! Thanks so very much for sharing this great idea! I saw your post over at “Somewhat Simple” blog and I am pinning this idea so I won’t forget it. Why do use the alcohol? Can’t you just color with the food coloring? 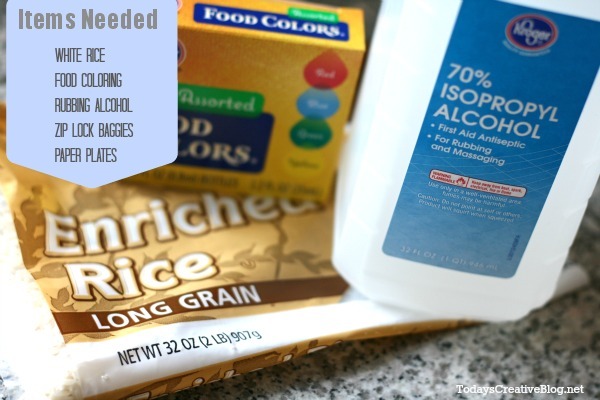 I’ve done it both ways and it seems to cover the rice better with more vibrant color when I use the rubbing alcohol. sounds super easy and such a fun look! I love this idea Kim! So fun and versatile! Will the color rub off onto whatever you put in with the colored rice? I’m wanting to use the filler in a jar for plastic spoons. I never noticed anything rubbing off. If you use the rubbing alcohol method like I did on the red, white and blue Patriotic post, it should dry it out faster. I wouldn’t get it wet of course.